What is Duckworth Splash Dog Toy? 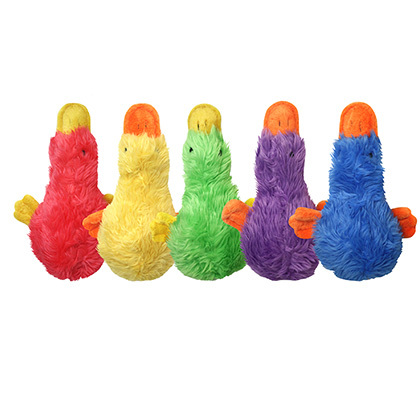 Duckworth Splash Dog Toy is a soft, fluffy source of endless entertainment for your pet. The size and shape make it a perfect cuddling companion for your dog and the internal squeaker adds an extra element of surprise and interaction. It is a wildly popular dog toy that quickly becomes a favorite! Perfect size and shape for hugging, cuddling and carrying. How does Duckworth Splash Dog Toy work? Duckworth Splash Dog Toy squeaks when squeezed in the middle. Play fetch or watch your dog have endless fun with this cuddly new toy. Discard toy when it is worn. Always supervise your pet when playing with this and other toys. Do not permit your pet to swallow this toy or any part of it. Failure to properly supervise your pet could result in serious injury to your pet. Moreover, this product should be inspected periodically for damage. The likelihood of injury to your pet increases if he or she is playing with a broken or damaged toy. Intended for pet use only. Keep out of reach of children. The Duckworth Splash Dog Toy is the perfect gift for your favorite four-legged friend. Give to your dog to play with.